Four weekends ago my sisters and I sorted through, looked at, and wondered at the amount of stuff in my parent’s home. The kitchen cabinets held more than we could have imagined. And so did the hutch in the dining room. Mom collected pretty tea cups, candle holders, various colors of taper candles, vases, figurines and other unique glass items. My dad’s office held the pencils, pens and highlighters that sat on his drafting table. An assortment of matchbooks, business cards, rubber bands, old stamps, pocket knives, his ledgers, old to-do lists and all kinds of items filled the drawers of his desks. The closets were full, too. Mom’s clothes were sorted by color. Dad’s for convenience. Her favorite blouse hung in hers, his old work shirt in his. Dad’s old puffy Alabama jacket that Mom hated hung in the foyer closet. The card tables and chairs we used on holidays leaned against the wall and the bucket of toys that all the grandkids played with were there. 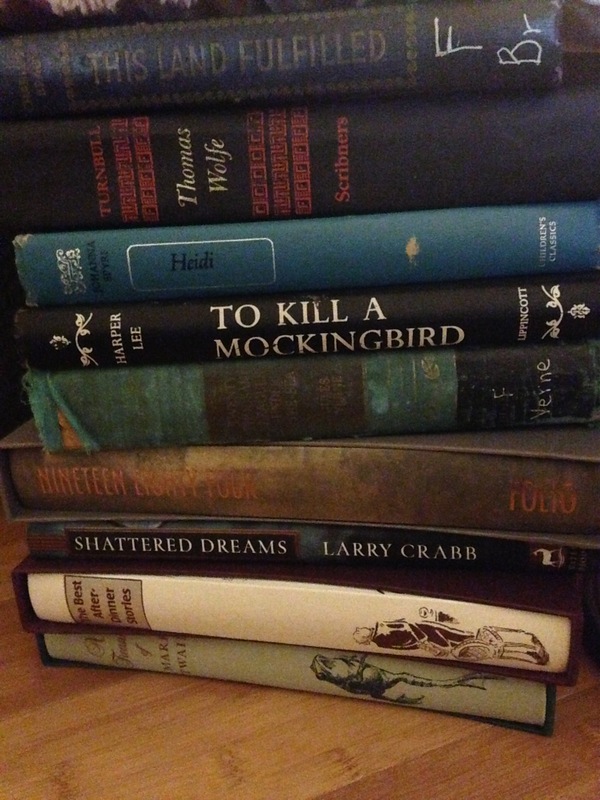 There were stacks and stacks of books, old records, and photographs. Collections of CDs, and piles of tables cloths, blankets, and bed sheets. Dishes, cups, pots & pans. Silverware and cast iron skillets. Old metal Folgers coffee cans filled with nuts and bolts and screws. Some with hinges, or wire, or batteries. Piles and piles and stacks and boxes of stuff filled the house. Our hearts are full of cherished memories, some painful ones too. But more than anything our hearts are piled high with love. Lots of love. Because our parents loved us and did a good job. They weren’t perfect and didn’t parent perfectly……who does? But they prayed for us and we always knew they were there for us. Always. 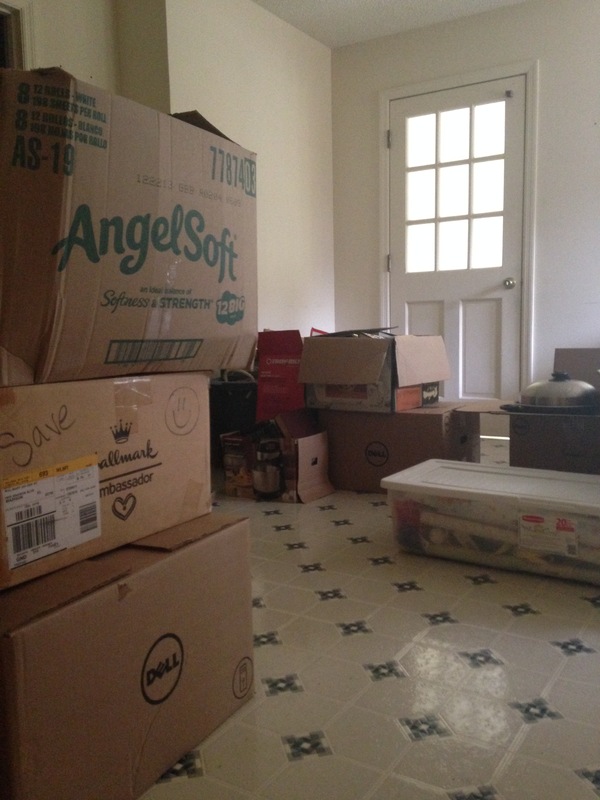 Now everything is boxed up……the house is almost empty. But our hearts are forever full. In response to the Daily Post’s Taper. Been there twice, a sentimental journey of letting go off whats precious on this earth and setting our focus on our heavenly home. Blessings. Thank you. The process of sorting, going through, and remembering with my sisters has helped with the grieving. Blessings to you. Those books are precious. I’m sure there’s a reason you chose them for this picture. God bless you as you laugh, cry & mourn through all of this. Thank you for the well wishes Belinda. I’ve done a little of all of those…wept and laughed and missed Mom & Dad terribly. More than anything, though, so grateful to have had them love me and teach me. Thank you. More on the title? What would you suggest? I’d like your input.